Which is the Best eCommerce Platform to Launch an eCommerce Store? With half of the total population of the developed countries preferring online shopping over in-store shopping, eCommerce stores will be the trend in the online business world. If you are thinking about launching an eCommerce store, you need to have a clear set of plans and strategies to kick-start your venture on a strong note. One of the most important things to select correctly is the eCommerce platform you will be using to build your eCommerce store. There are so many eCommerce platforms available and instead of leaving it to the web developers, you can hire freelance web developers to work on the platform of your choice. What are the determining factors you need to watch out for? Since there are many leading eCommerce platforms available to choose from, you have to watch out for certain core factors to differentiate the best one from the rest. Speed, Performance, SEO – The first thing to watch out for is the loading time the platforms are promising. If any eCommerce store has a slow loading time, users are going to get pissed and the first impression will be worse. The second factor is the performance and speed. You need to watch out the websites built on your chosen eCommerce platform to find the factors out like how fast you can switch between pages, how fast the inner pages are loading and likewise. Similarly, you have to watch how such websites are performing in terms of SEO. The bottom line is that the user-experience should be flawless from the eCommerce platform’s side and the rest is dependent on the web developers. Customizations, Scalability, Integration – The backend has to be robust so that you can load any product anytime, put products on offer and sale and change necessary details instantly without the need of a web developer. Furthermore, it should be scalable for future expansion otherwise it is going to be a headache to change the platform both for online users as well as for backend staff. Last but not the least, there should be options for complete integration of inventory, marketing tools, various other tools that are necessary for an eCommerce store. What are the leading eCommerce Stores Available? Shopify – It is the most popular eCommerce platform. The basic plan starts at $29 per month and it can go up to $299 with all the advanced features. There is another version called Shopify-Lite that allows you to sell products and services on Facebook and on your separate website. BigCommerce – It is a complete eCommerce platform in terms of integration. There are unlimited templates to choose from to suit your type of eCommerce store design and all of them are totally customizable. It is very easy to migration to BigCommerce and it is highly user-friendly. It comes with great management tools for reporting, analytics, marketing, order and product management and you can integrate with various apps like eBay, Facebook, MailChimp and you can even get multiple currencies in the shopping cart. Magento – Magento has some of the largest and popular eCommerce stores in the world. It is popular for its flexibility and functionalities. It is best for fashion and B2B eCommerce stores. It is developer and user-friendly and the plans are customizable yet very expensive for startups. Volusion – Volusion is a cloud-based eCommerce platform but you need to hire freelancer web developers often for editing purposes. It is highly SEO-friendly and there are apps available to check your store from backend on the go. The shipping platform is quite advanced and integrated with the inventory. Most importantly, there are features like coupon, reward, affiliation which are highly important for an eCommerce store. The basic plan is $15 and the highest is $135 per month. 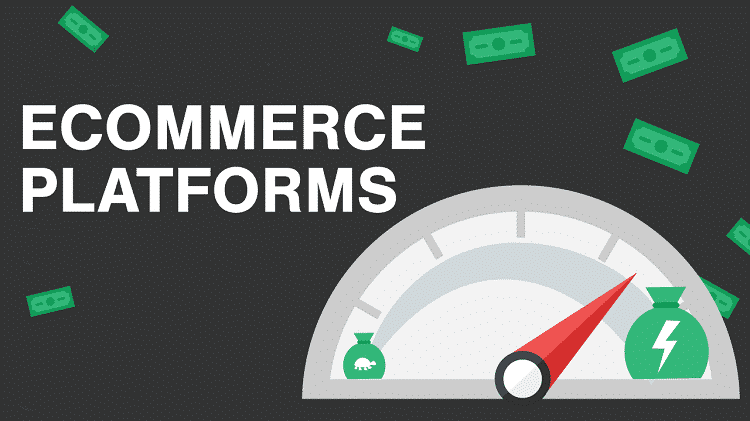 WooCommerce – WooCommerce is not exactly a complete eCommerce platform but a plugin. You need to have a WordPress website to integrate it and the best part is it is completely free. Hence, it lacks many premium features that other platforms offer. But apart from basic features, you can do email marketing jobs and even include coupon code facility. You can also sell digital products and many people prefer it for the same reason. Which is the best eCommerce platform among them and why? Shopify is the best eCommerce platform to launch an eCommerce store. There are multiple reasons why it is still the most popular and the go-to platform choice for all entrepreneurs. Not only does it offer exclusive features that its competitors lack but also premium-quality themes. It has the mobile-first approach and the highest SEO-friendliness. So, the designing and reaching out organically are taken care of completely. It has unlimited bandwidth and it can integrate your store with fulfillment centers, shipping centers, inventory, marketing tools and likewise. It has the point-of-sale system and there are mobile apps to manage your store on the go. There are over 1500 apps like plugins and extensions that will make your eCommerce store the most feature-rich website in the market and give you an edge over established competitors. You can connect to your Facebook page and sell directly. Web developers can build store app effortlessly. The support team is very corporative and available all the time. Therefore, Shopify should be your first choice if you want to launch an eCommerce store from scratch. You should start by posting freelance jobs to hire Shopify developers and make your website eye-catching, most user-friendly and feature-rich.